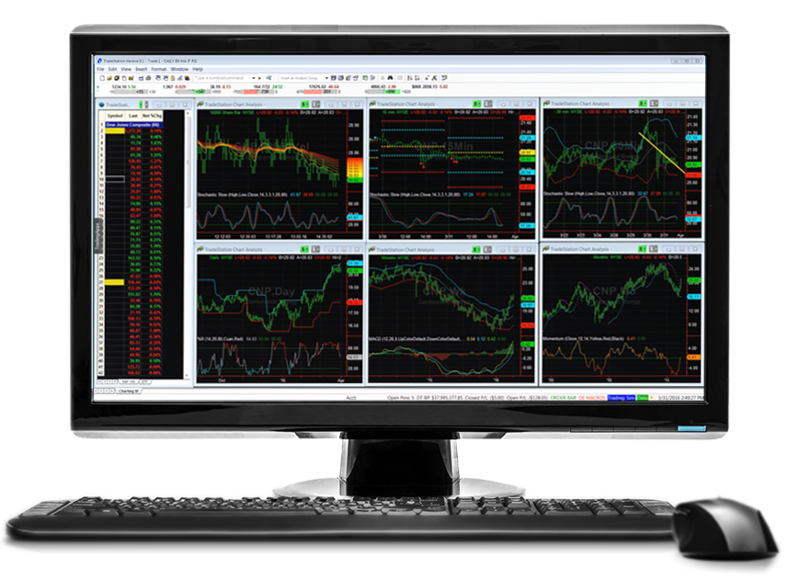 No matter which markets you trade – stocks, options or futures – TradeStation gives you cutting-edge trading tools, education, and support. Trade anywhere anytime with our powerful mobile and web trading apps. And now you can get all of this and a great introductory offer as well. Open and fund a new TradeStation account and get 20% off commissions up to a total of $1,000. * Options trading is not suitable for all investors. Your account application to trade options will be considered and approved or disapproved based on all relevant factors, including your trading experience. Automated trading, as it relates to direct-access electronic placement and execution of equity options trades, requires manual one-click verification before order is sent. Each leg of a multi-leg spread incurs a commission and bid/ask cost that can be significant. A $14.95 fee applies for options exercises or assignments at expiration. For early options exercises or assignments, a $1.50 per contract fee will apply, with a $5.95 minimum. TThere is an Options Regulatory Fee that varies by options exchange, where an options trade executes and whether the broker responsible for the trade is a member of a particular exchange. As a result, TradeStation calculates a blended rate that equals or slightly exceeds the amount it is required to remit to the options exchange. A $1 cancellation fee may apply. These costs will affect the profitability of all stock and options trades and should be considered prior to making any trade. Please visit TradeStation.com for a link to the document titled Characteristics and Risks of Standardized Options. ** Get 20% off Commissions up to $1,000; valid for clients who open and fund a new equities and/or futures brokerage account. Customers will be eligible for a maximum commission rebate amount not to exceed $1,000. To receive the rebate, accounts must be funded with $500. Rebates will be processed monthly and automatically applied to the account holder’s balance until the maximum rebate amount is achieved ($1,000). Commission rebates shall be limited to commissions for trades of equities shares, futures or options contracts that are executed through the TradeStation platform, and cannot be applied towards mutual funds, futures options, bonds or private placements, or trades of any kind called into the TradeStation trading desk. Commission rebates exclude exchange fees, regulatory fees or other account fees and charges, including margin interest, if any. TradingApp® Store is a registered trademark of TradeStation Technologies, Inc.
No offer or solicitation to buy or sell securities, securities derivative, futures products or any type of trading or investment advice, recommendation or strategy, is made, given or in any manner endorsed by any TradeStation affiliate and the information made available on this Website is not an offer or solicitation of any kind in any jurisdiction where any TradeStation affiliate is not authorized to do business, including but not limited to Japan. Past performance, whether actual or indicated by historical tests of strategies, is no guarantee of future performance or success. There is a possibility that you may sustain a loss equal to or greater than your entire investment regardless of which asset class you trade (equities, options or futures); therefore, you should not invest or risk money that you cannot afford to lose. Before trading any asset class, customers must read the relevant risk disclosure statements on our Other Information page. System access and trade placement and execution may be delayed or fail due to market volatility and volume, quote delays, system and software errors, Internet traffic, outages and other factors. TradeStation Group, Inc. Affiliates: All proprietary technology in TradeStation is owned by TradeStation Technologies, Inc. Equities, equities options, and commodity futures products and services are offered by TradeStation Securities, Inc. (Member NYSE, FINRA, CME and SIPC). TradeStation Securities, Inc.’s SIPC coverage is available only for equities and equities options accounts. Copyright © 2001-2019 TradeStation Group, Inc.
TradeStation Salutes pricing is available to current and former members of the U.S. armed forces. Please specify your status below. Applicants may be asked to supply their military ID or DD214 ID for verification purposes.